Bill Junior "B.J." 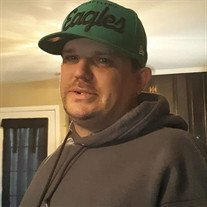 Samon, 38, of Springfield, passed away on Wednesday January 9, 2019 at his home. Funeral services will be conducted Sunday January 13th at 3:00 p.m. in the Oakhurst Chapel of the Robertson County Funeral Home with Reverend Jerry Heflin officiating. Honorary pallbearers will be Michael Moses, Monk Stout, Bubba Smith, Will Smith, Nathan Smith, Donnie Wallace, Terrell Payne, and Denny Abbott. The family will receive friends on Sunday from 12:00 noon until service time at the funeral home. B.J. was born March 21, 1980 in Springfield. He worked in general labor jobs and was of the Baptist faith. B.J. loved the Philadelphia Eagles football team and always loved his family. He was preceded in death by his daughter: Alisha Randolph Samon, his step-father: Gregory Abbott, and his grandparents: Jodie and Anna Parks. B.J. is survived by his mother: Mildred Parks Abbott of Springfield, his father: Bill Samon of Pinellas Park, FL, his brothers and sister-in-law: William Ray "Bubba" and Rebecca Smith of Cedar Hill, Dalton Samon of Pinellas Park, FL, Jimmy Abbott of Wyoming, and Mike Abbott of Neveda, his sisters: Lori Jones of Springfield, and Angela Samon of Pinellas Park, FL, his nieces and nephews: Briana, Kelsey, Will, Nathan, and Chole, and by several aunts and uncles. If so desired, memorial contributions may be made to Robertson County Funeral Home for the B.J. Samon funeral fund.